is there a way to import a video of a person speaking into a location in a 360 pano image? Probably not matterport but any other cameras/software that would be able to do this? You can put images and videos in panos. I've put transparent PNGS of people inside panos using an image editor. And here's a demo of a video running inside a pano. You could make that video any size or shape and put it anywhere you like. They chose to put it on a billboard so it's anchored in that location. I'm playing with video now. However, I would think that Metroplex360's MatterPlus would let you embed anything you like in a pano. I can't log in to test it so I don't know how the creation part of it works. Here's an example of a KOLOR tour where you have an actual person in the pano. The only way I have found to do this easily and relatively quickly is to use the Kolor solution. Here is a very early test I did. It was just to try out the technology and I have not had any call for this beyond the initial test. Happy to let you know the challenges. I am based in AU also. @Kenny @DanSmigrod I can technically dress up a Matterport tour however you would like it using MatterPlus and layering things and tying events to them. I have the 'workbench' set up so to speak -- however, the problem for me is that at this point, building more on the platform might set others up for disappointment when and if the platform is no longer able to function due to some changes made on Matterport's end. If someone has ideas for MatterPlus that they are willing to provide the assets for (i.e. - they HAVE the animated person READY to GO) - I am interested in implementing it for the sake of a proof of concept. #1) Being a We-Get-Around member. #2) Purchasing an iPad Matterport Video of the tour that you do so that we can both document the proof-of-concept and support other great 3rd party services. @Kenny I've been trying to work out how to achieve this too. I'm assuming you mean a video of a person with no frame around it, almost like a hologram, like a realtor is showing you round. Everybody has probably thought of it, no unique thinking from me. Main problem I can think of is that nobody wants to listen to somebody with their back turned on them (even if that somebody is a hologram) and you can never know the user's behaviour moving around the space. Unless you stop the user from moving while the animation is playing. Otherwise it would take a hell of a lot of video making from different angles, editing and syncing with Matterplus to make it anywhere near effective. For me I'd say a standard video taken inside the respective room of the house then launched as a trigger event upon entry to the respective room is the only viable solution short and long term. Get involved with Matterplus to possibly find a work around to help achieve what you're looking to do. If Matterport has a Try It page, why not have a Try It page for MatterPlus since they're both helpful. That way, people without accounts could test MatterPlus. Realtors aren't the only potential customers. We have prospective photographers, buyers and sellers who might decide to hire a realtor who uses Matterport -- once they understand Matterport's benefits. One benefit is the unofficial MatterPlus app. You also get a free pool of beta testers when you open up an app to more than a few. This solves the "my back is turned and I can't see my virtual realtor" problem ..
That's a Site Pal. Those have been around forever. You put one of those avatars on your website and the site pal avatar communicates with your site visitors. Metroplex360 solved a problem by putting something ON TOP of something else. The something else is a Matteport model. His something is code he injects that in a logical way runs on top of the Matterport model. That is, it's not code Matterport wrote. Instead of putting a person on top of a pano, why not put one on top of your Web page that hosts the model? Software like Site Pal's let you do that. I used to play with these types of avatars in the old days. You can make them appear, disappear, move to different screen locations, shrink, grow, etc. The fade-in effect is particularly impressive. You don't see one for a while then suddenly it fades in to explain something. A good screen location is near the clock on your system tray. Since MatterPlus knows where you are in a home, it can make sounds and voices happen in response to events. If you can control a site pal's facial expressions, motions, lip movement and words, perhaps that site pal could become your tour's "virtual realtor." * Get your message across. * Influence users with a spoken call to action. Those also seem to be goals of posting a Matterport model. 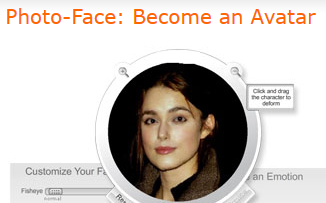 If you'd like a more realistic avatar, Site Pal says it can put your face on one ..
A big benefit of not using a video of a speaking person is you don't incur the cost of downloading a video to a person's computer or mobile device. And, since software controls an avatar's speech, it probably can say a lot more than a prerecorded video can. Unlike a video, an avatar can respond in real time to user input. Maybe an additional "action" Matterplus can perform in response to user input could be "manipulate the avatar." For instance, if a user approaches a kitchen sink, the avatar can x. X can be anything. @Metroplex360 - Here's Site Pal's API page listing available functions .. Since I haven't seen a Site Pal in a while, I'm wondering if they went out of style. On the other hand, maybe they could effective virtual realtors that interact with people on virtual home tours. Hololens can make a person appear in your room. I'm hoping that later versions of Microsoft's VR headset will let you make a hologram appear inside your VR world. Microsoft implied that early headset versions wouldn't have advanced holographic capabilities. If I could summon up a person inside any VR app, there's my virtual realtor. Thankyou for all the replies.